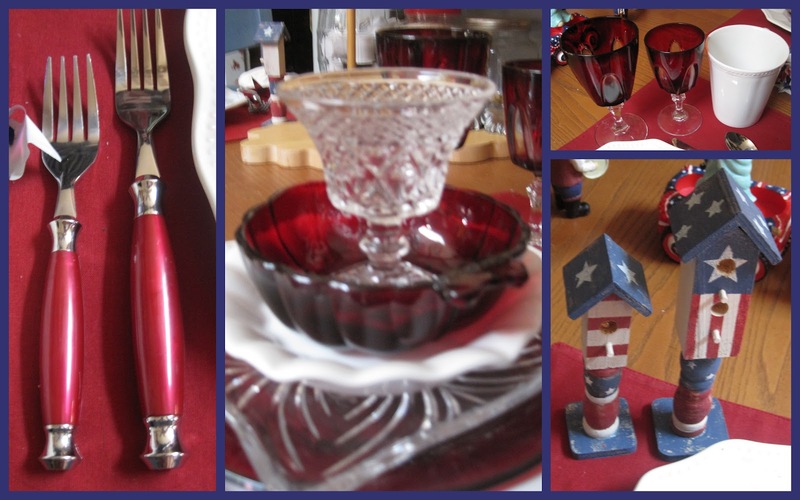 The 4th of July at our house is a series of special meals and great tablescapes! Some are done on the kitchen table and are relatively simple; others are outside and at least one will be set on the dining room table. The temperatures are in triple digits in Southern Illinois, so other than very early morning coffee on the back deck or late evening refreshment on the front porch ... we probably will not be outside! So, here's the first of a few tables I'll post in the next week! 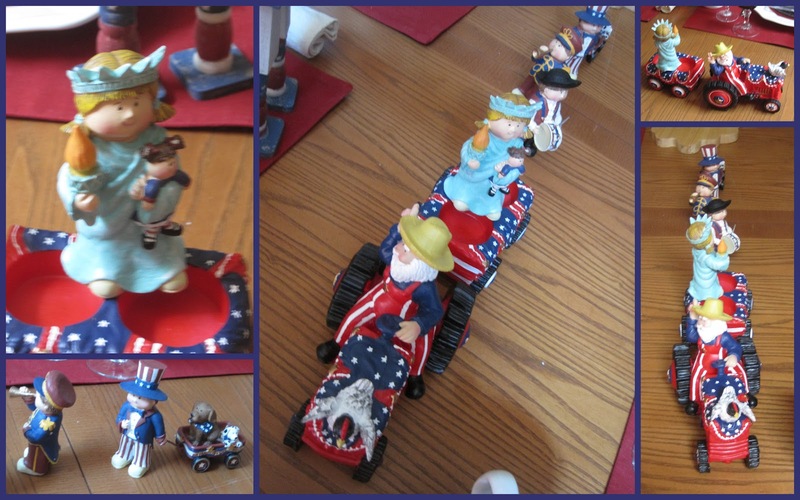 I love the little parade characters down the center of the table. I don't even remember where I got those, but I bought them to entertain Miss Phoebe! The little boy pulling his wagon with a dog in it reminds me of my own childhood! I pushed a doll carriage filled with kittens in a parade when I was about 6 ... and all the kittens jumped out and ran down the street! People were grabbing them and giving them back to me. I managed to get to the end of the parade route with all the little cats ... but it was quite a job! 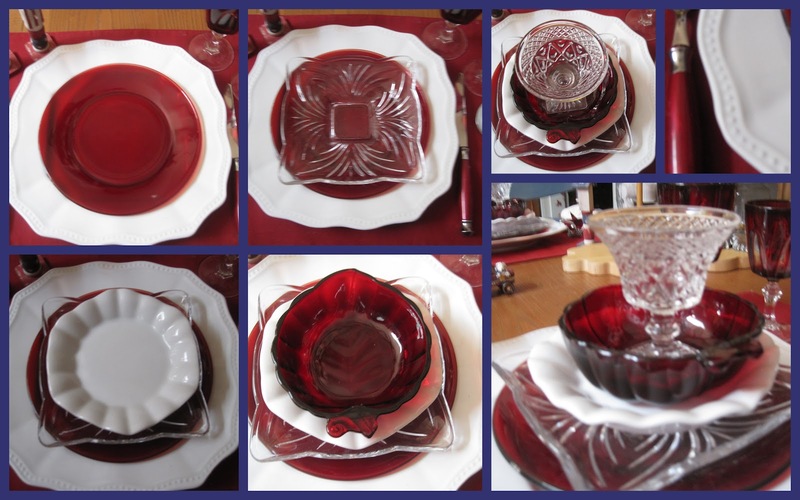 This table is set with milky white plates and mugs combined with ruby red Depression Glass and an Cape Cod cocktail glass. We'll start this meal with Shrimp Cocktail. 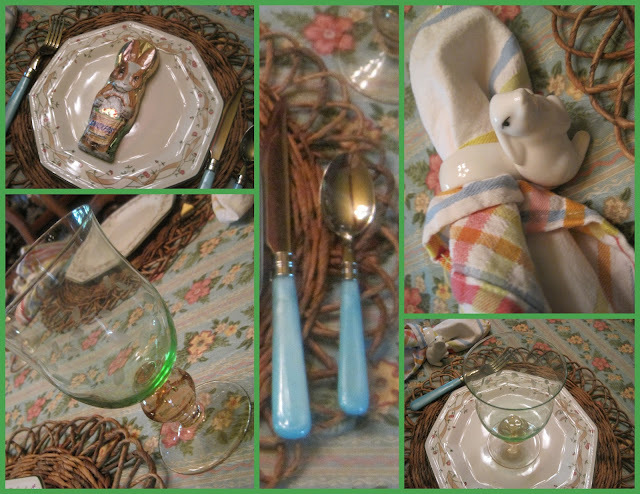 The little bird house ornaments sit at each place setting, and the Cambridge flatware adds a little more lustor to the setting. 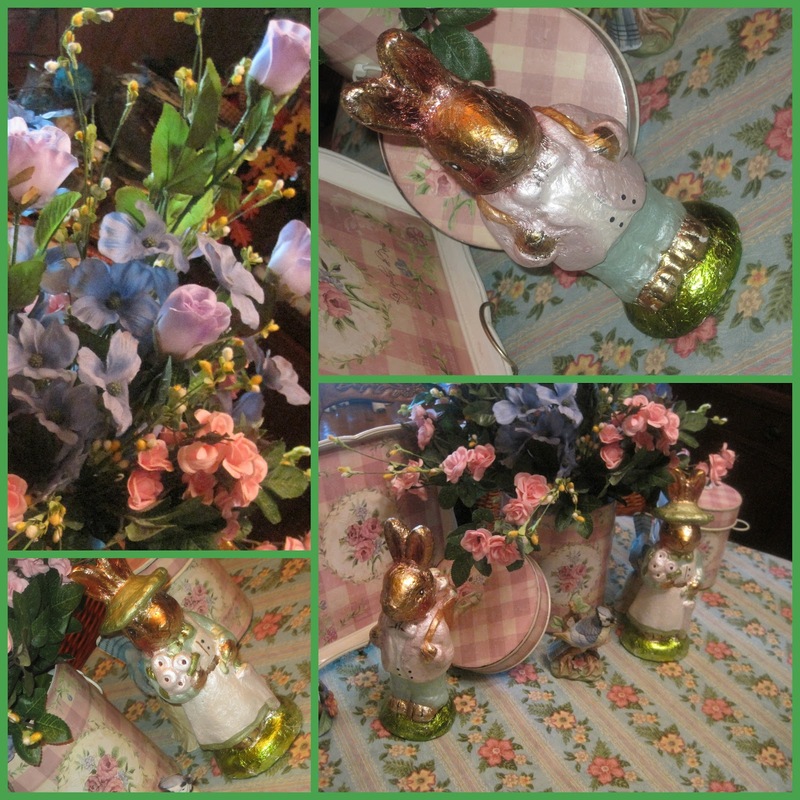 This is one of my favorite decorating pieces, and I actually have several of them. 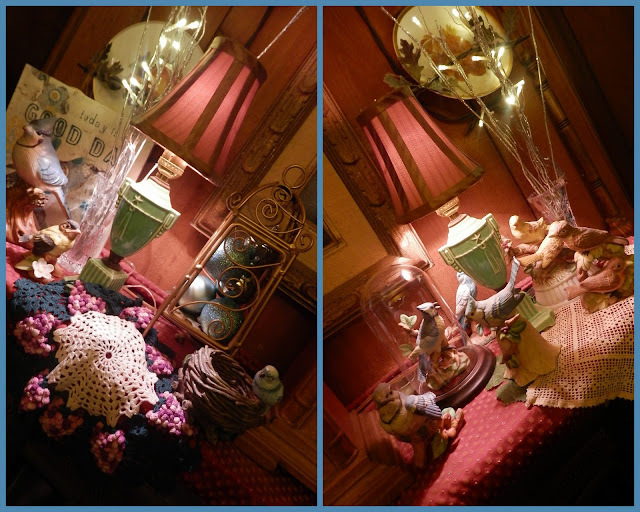 It is easy to change the seasonal decor in the bottom of the hurricane. I'm linking with several of the parties shown in my side bar, so make sure you click through to see the other posts! Happy July 4th! Try to stay cool. I'm partying with Common Ground so make sure you click through to visit the other posts. 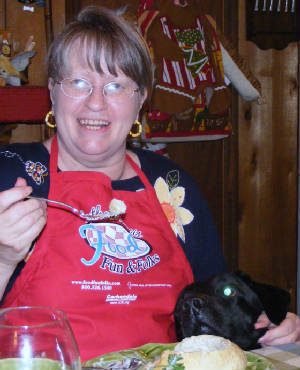 Miss Phoebe brought her mom and dad over for Sunday supper! 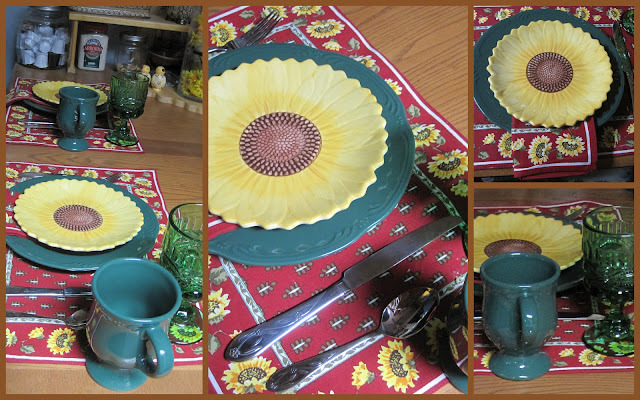 So, I set a simple table using Pfaltzgraff Hunter Green dinnerware, Bull's Eye stemmed glasses and sunflower plates. 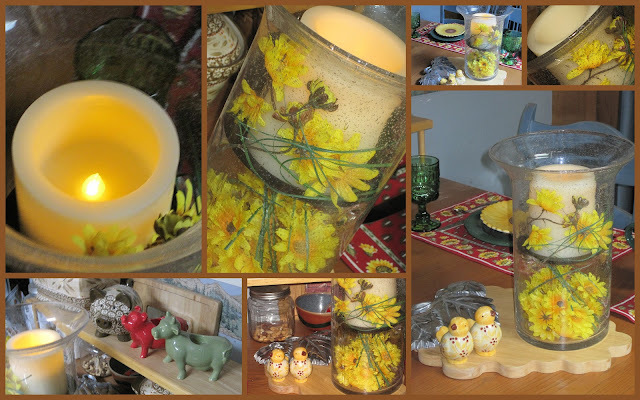 The centerpiece is a candle that I keep on the kitchen table most of the time. 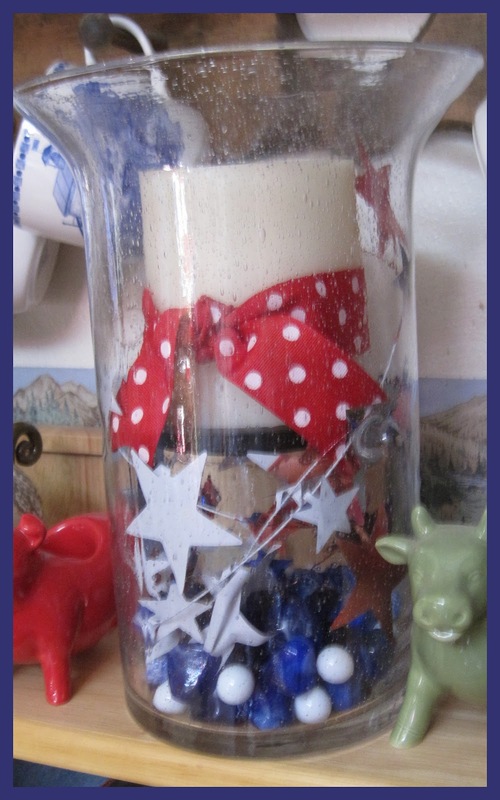 I change the filler in the glass container to go along with the seasons or the table theme. Silk Black Eyed Susans were perfect to go along with the sunflower place mats and plates. I love the battery operated candles! I am the lucky owner of a gas grill that has an oven in it. 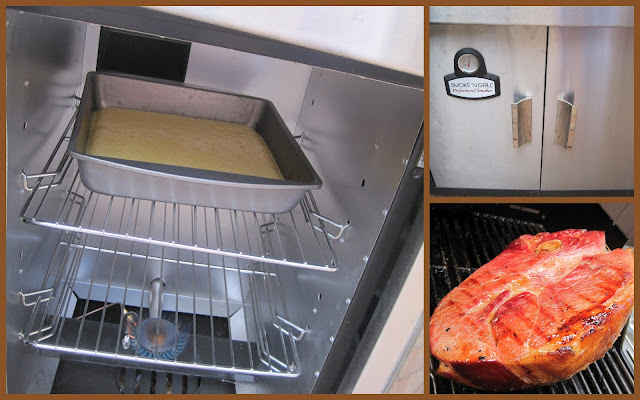 It is designed to serve as a smoker and an oven and the temperature goes up to 450 degrees, so it is perfect for baking a pan of cornbread to go along with our glazed grilled ham. 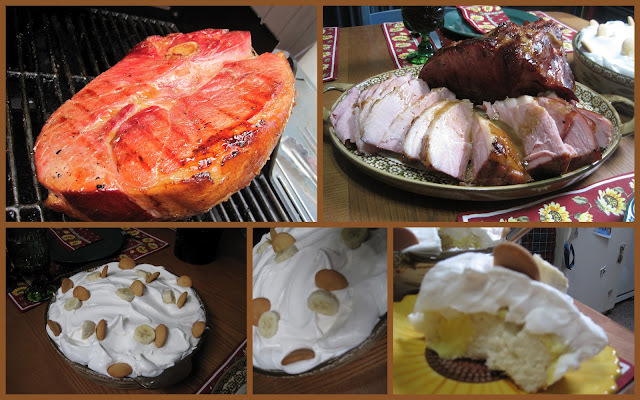 I mopped the ham with a key lime mustard vinegar glaze and served it with cheesy potatoes and baked beans. My daughter brought her famous deviled eggs and our dessert was fantastic! I made a white "poke cake" and topped it with banana pudding, a layer of sliced bananas and another layer of whipped topping. It is a perfect ending for a summer night's supper! I'll be posting with several of the parties shown in my side bar so make sure you click through to see all the other party posts! Hope you have a wonderful week! click through to visit the party! The Back Deck is Filled with Chickens, Pigs and Rabbits! 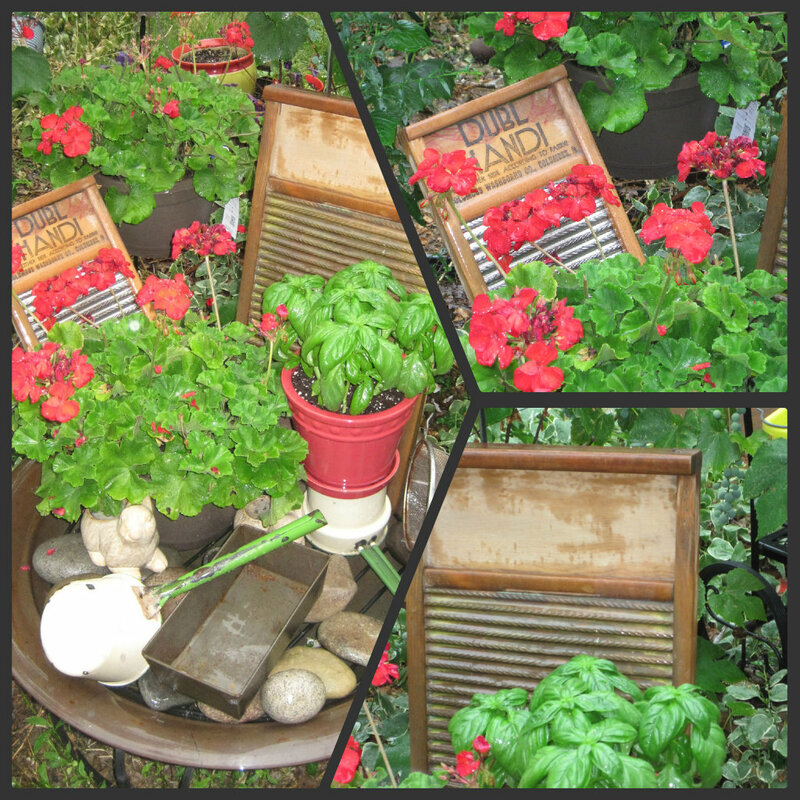 For the last couple years, I've wanted to use my small collection of wash boards in my flower garden. 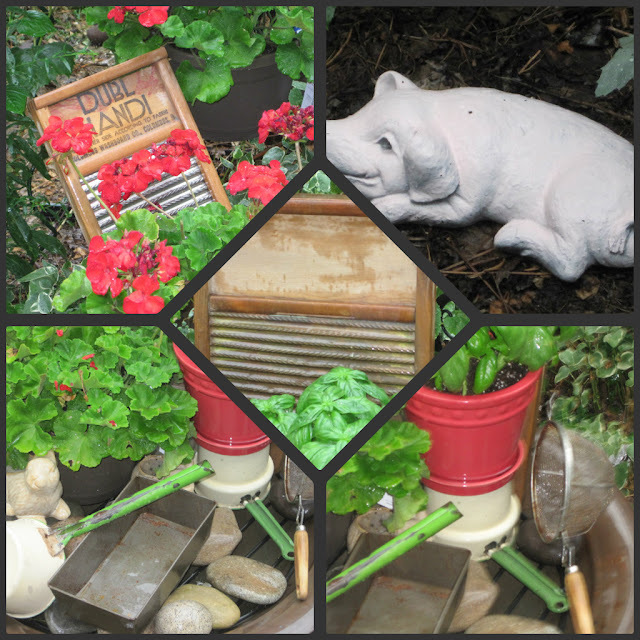 I have an old wash tub and a few other vintage pieces that helped me blend it all together. My pink pig was a gift from my sister years ago. Piggy has been gray, hot pink and now is a soft real piggy pink! The old tub is a 1950 vintage and belonged to my husband's grandmother. We've always used it for summer parties ... to ice down watermelon! 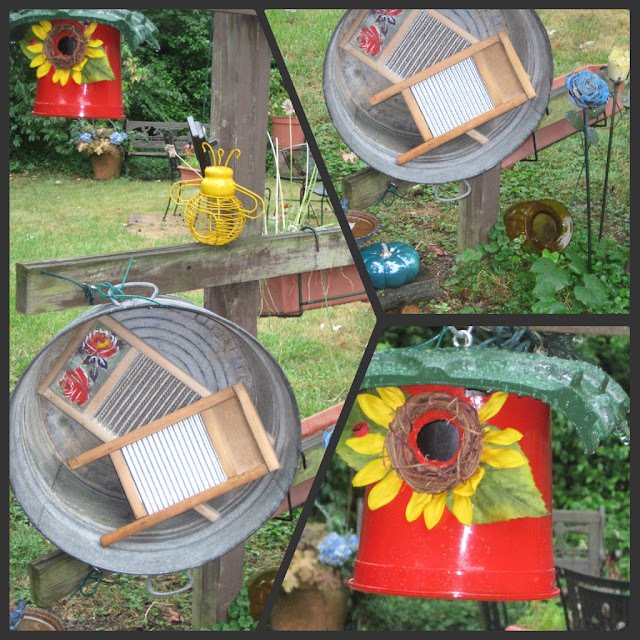 The red bird house is a new acquisition and the roof is made out of a piece of an old tire. I've been unloading all kinds of storage spots because I've opened up a big booth in an antique mall. 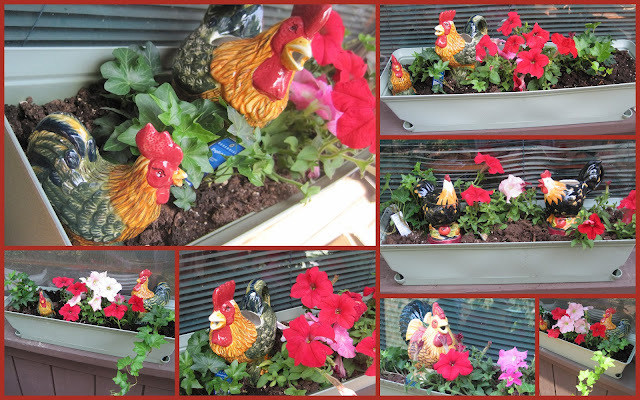 When I ran across my collection of little chicken teapots, I decided to use them in my flower boxes. I always think the boxes look empty until the flowers really fill out, so adding the chix filled those empty spaces! I have new cushions this season and, of course, had to use lots of red! I've had some of my wrought iron furniture for almost 30 years. When some of it has been damaged in storms, I've just taken it to the welding shop! You cannot go wrong with wrought iron! 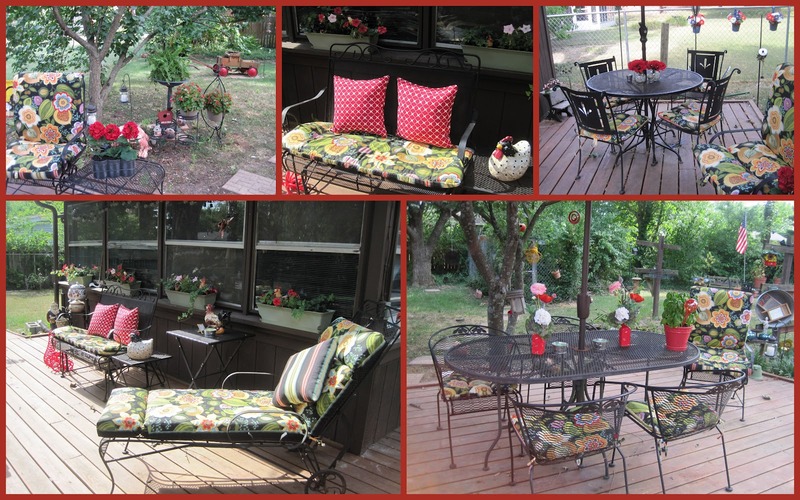 I always use a few faux flowers on the deck. 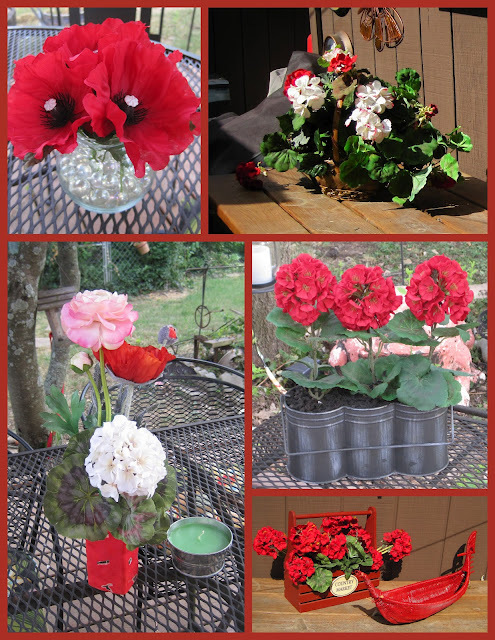 Red poppies, geraniums and a few pink and cream colored accents ... have been great for entertaining. 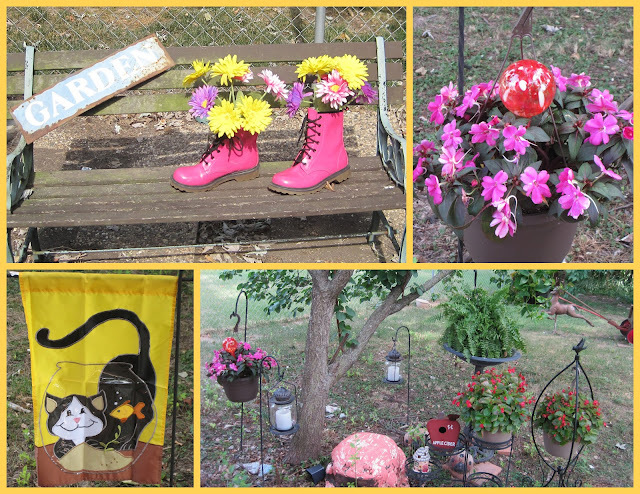 I love quirky things, so filling an old pair of pink patent boots with silk flowers was a natural for me! Sure is a conversation piece! Thanks for stopping by. I'm going to post with several of the parties in my sidebar, so make sure you click through to see the other posts! hope you have enjoyed the month of June. Can you believe it's almost over? Do you have certain things that are like members of the family? It is hard to part with them, even when you should?? This wicker rocking chair is one of those things. I have had it for 30 years and it spent most of its life inside the house. In recent years, though, I've used it on the front porch where it is under cover, but last winter the cover I put on it to store it for winter ... blew off ... and rain blew in, so it was wet for about a week. Not good on old wicker. Spray paint to the rescue! I scraped all the old paint off, sealed it, repaired the broken rattan and gave it a new color! So, it is back on the front porch, surrounded by the Sunday newspaper and still offers a favorite spot for rocking! 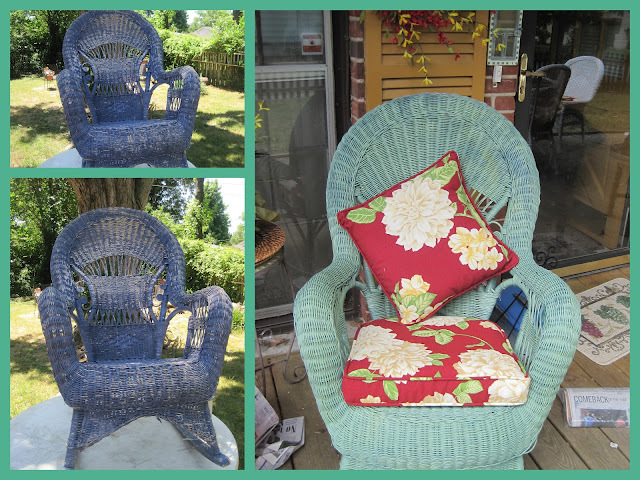 This old settee is outdoor wicker (plastic) and has certainly seen better days. I replaced it with a new one, but didn't want to just toss it out, yet. So, It became an ornament ... that holds other ornaments! 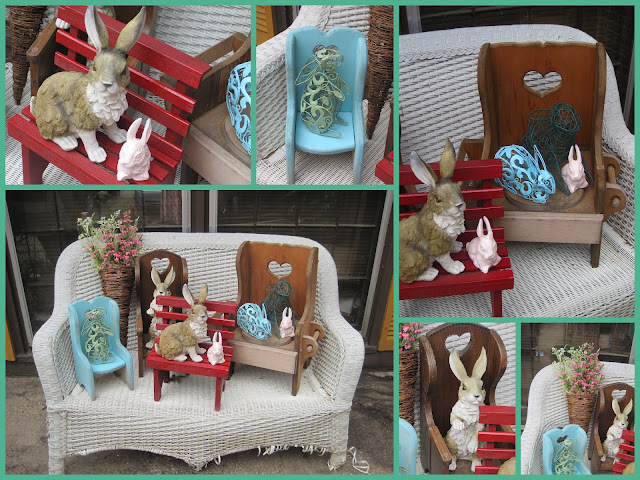 I still need to do a little trimming, but it works perfectly to showcase some of my little chairs and rabbits! I think it will be equally adorable filled with pumpkins in the fall ... snowmen in the winter ... and then the rabbits will return for spring and summer! 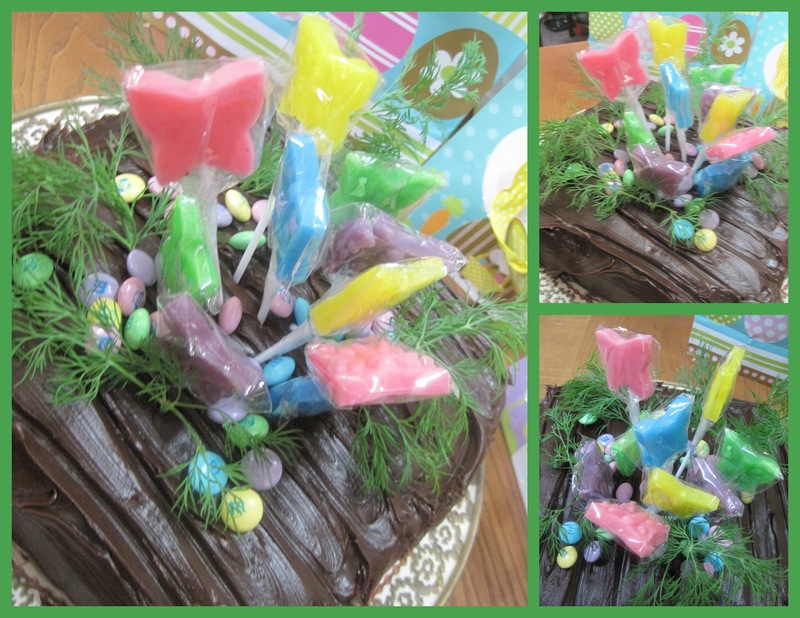 Hope you'll take time to visit my Hubpage posts! As always, drop by Metamorphis Monday to see all the other posts! Happy Monday! I'm changing my life these days! I'm still a very happy grandmother and an author of three cookbooks, but I've given up my newspaper cooking column and have shifted to blogging on a regular basis! What fun to be able to hear from people all over the world who enjoy what I love to share. This site is dedicated to all things life styling! 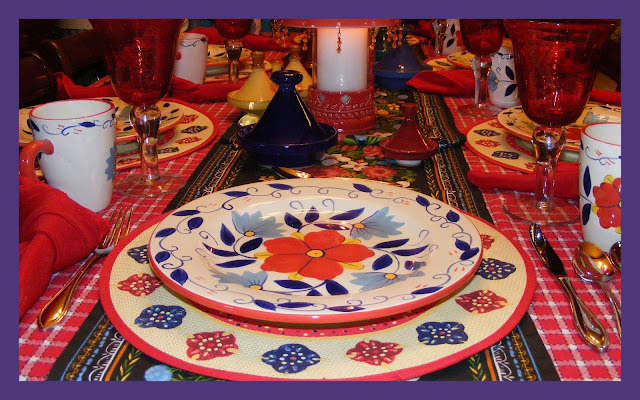 You'll find tablescapes, party menus, recipes, pictures and stories about my perfect Miss Phoebe and all the things we love to do together. I hope you visit my sister site that is dedicated to my newest venture! I've set up a double booth at my favorite antique mall in St. Mary's, Missouri. St. Mary's is just a few minutes south of St. Genevieve ... a perfect little French Colonial community that is quite the tourist spot. Here's hoping you'll continue to follow all the things I'm doing ... and always let me know what you think! Check out Rolling Red Truck Treasures! My little bunny wouldn't let me take her picture today! She was a happy little girl, though. She got books and lots of little toys in her goodie bag at my house and a movie and a little candy and lots of other things from the Easter Bunny that stopped by her house! 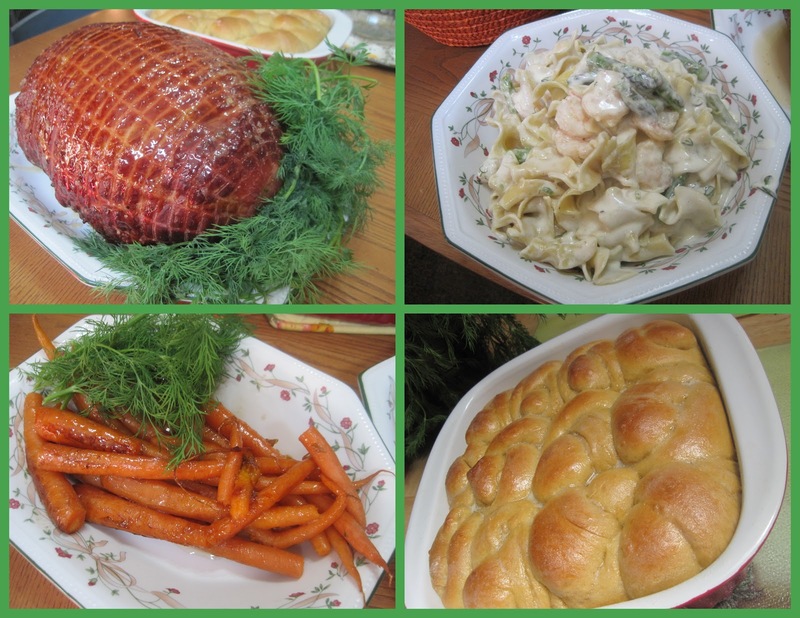 Here are pictures of other parts of our day! 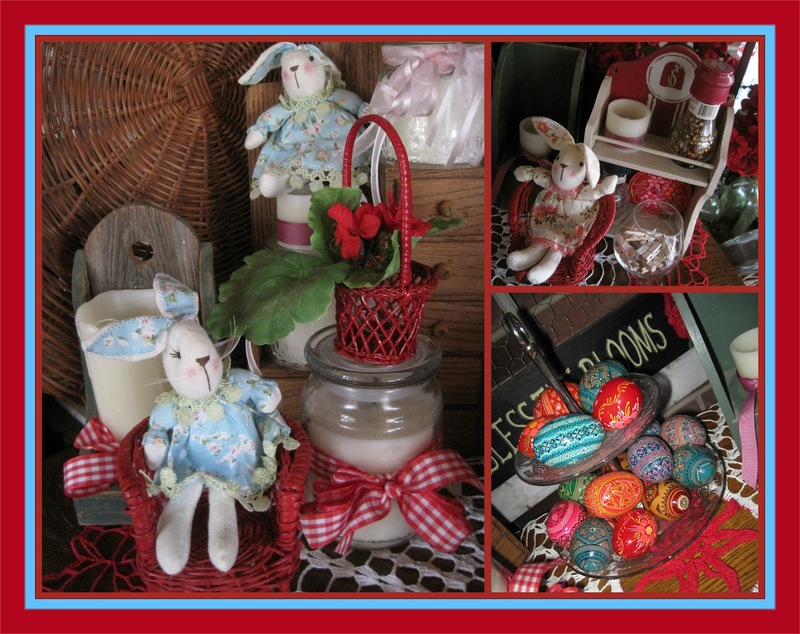 Red Easter in the Sunroom! immediately knew where I was going to hang it. We have several "blooms" and "grand-blooms" and they mean so much to us. 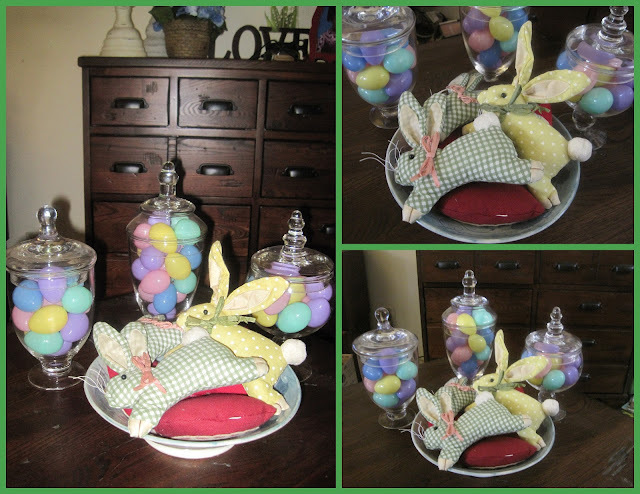 are perfect for the bunnies and eggs! 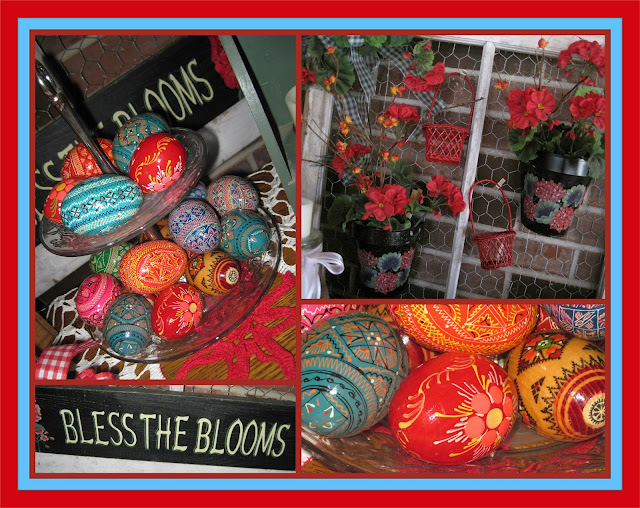 My painted egg collection is filled with several red ones ... so it all fits together! doily hanging on the freezer door! 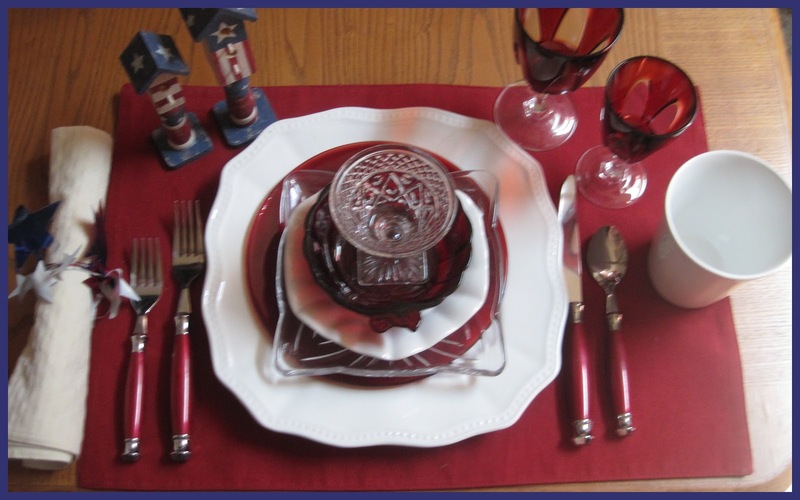 This is one of my favorite red tablescapes. It comes from my annual Moroccan dinner party! 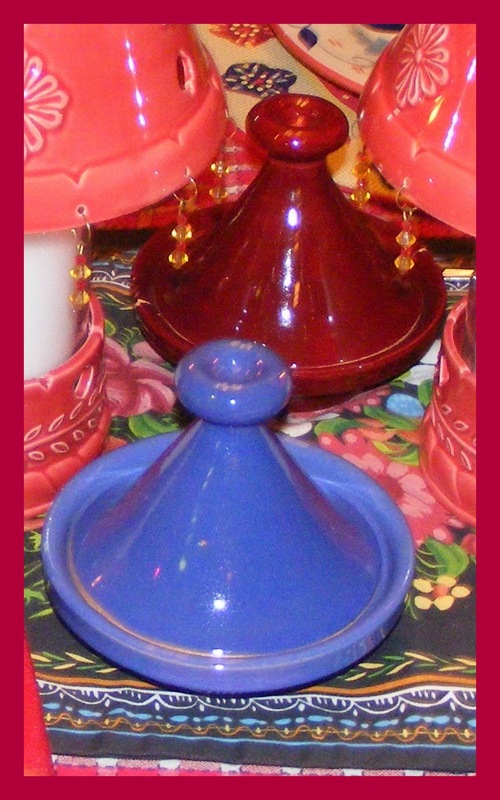 The tiny tajines in the middle of the table are filled with condiments! Make sure you click through to join the party! 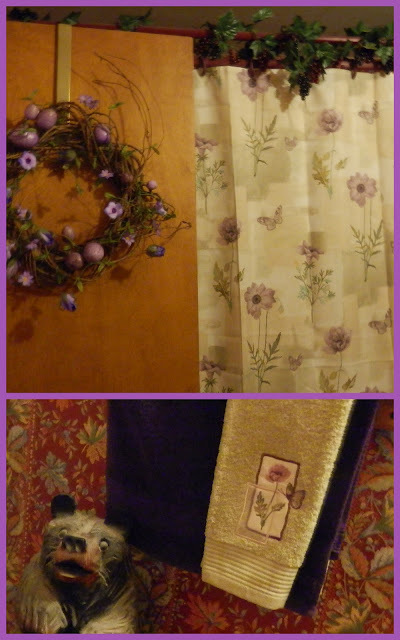 It's Purple in the Pottie! 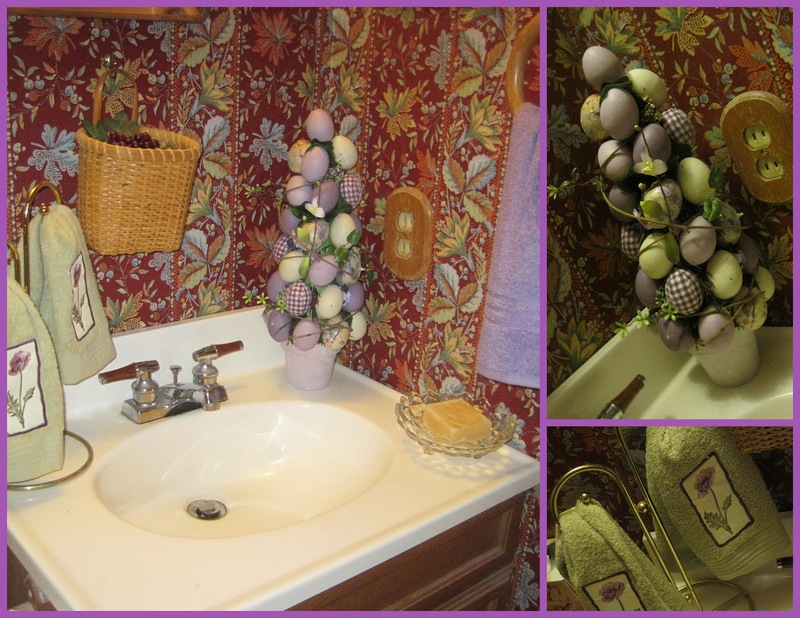 the decor in one of my bathrooms! 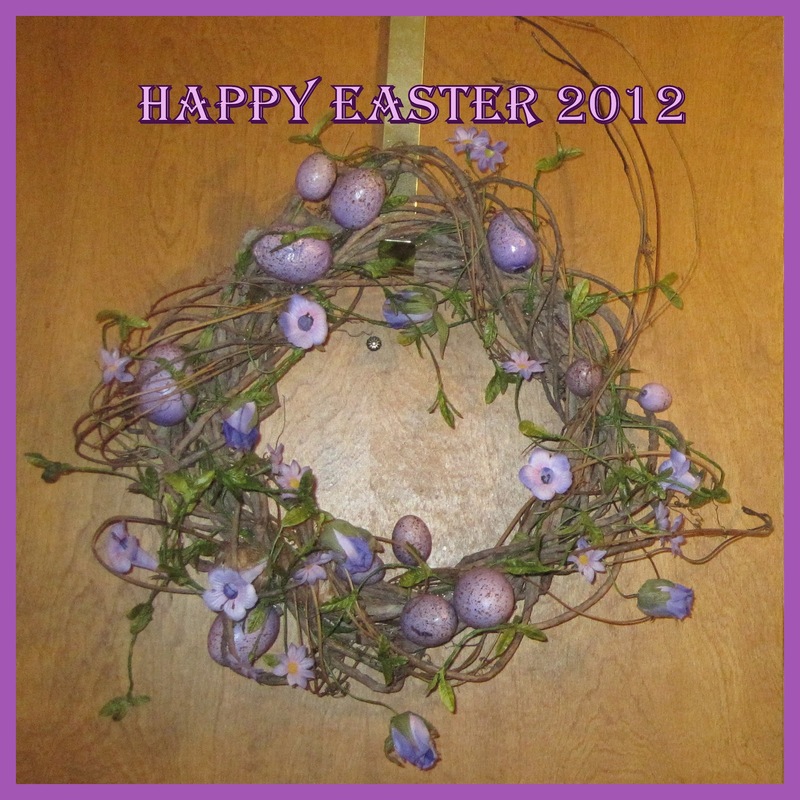 You would be welcomed into this little powder room with this cute wreath! 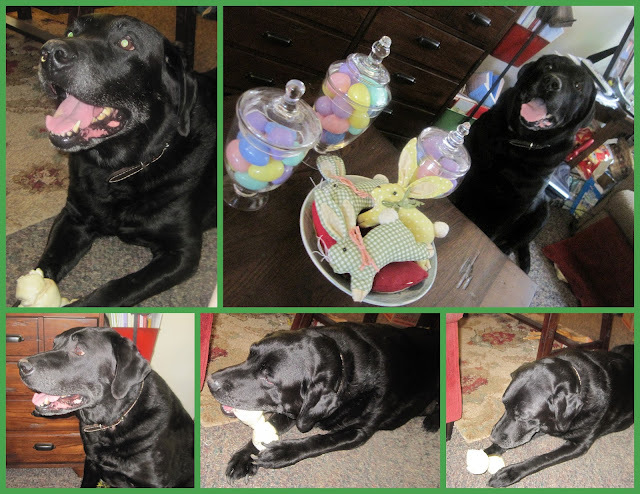 Miss Phoebe loves "Robin Eggs" in all colors. She makes up stories about saving Robins! The Easter Egg tree is a big hit, too! 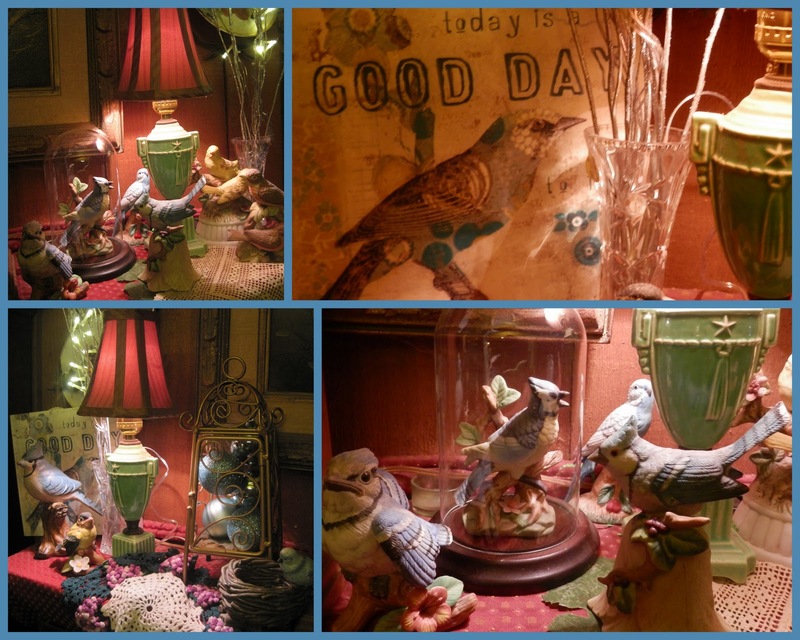 The little table I keep in that room is a perfect place to change the seasons. It never takes much to get that done ... just a little shopping through the house. 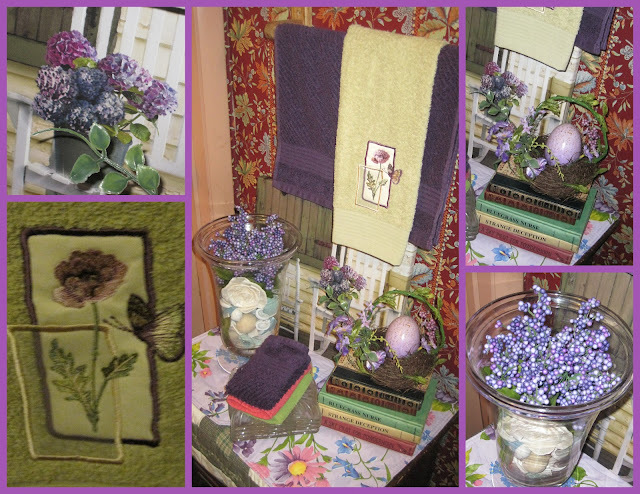 Purple is the color of choice for this spring. Who says red and pink aren't pretty together? 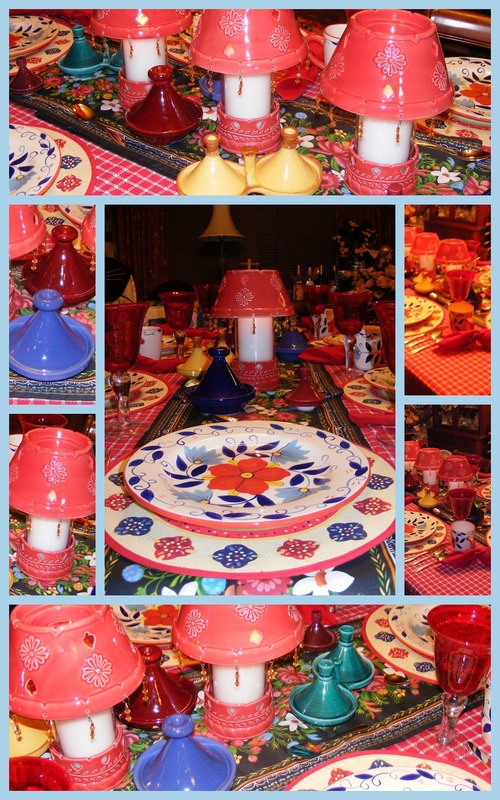 I love to keep red in my sunroom all year round, but I have many other things that I love to use in that room, so I have to mix it up a bit! 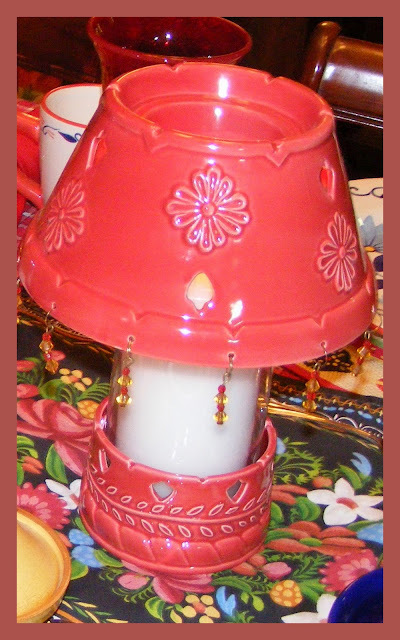 So, Spring in the sunroom will be red and pink! Here's the tabletop of the buffet server! One of my favorite decorating pieces is the crystal hurricane. I love changing seasons by filling it with potpourri. to have a little pink and purple added to it! My bee hive beverage decanter gets used almost every weekend during the spring and summer. 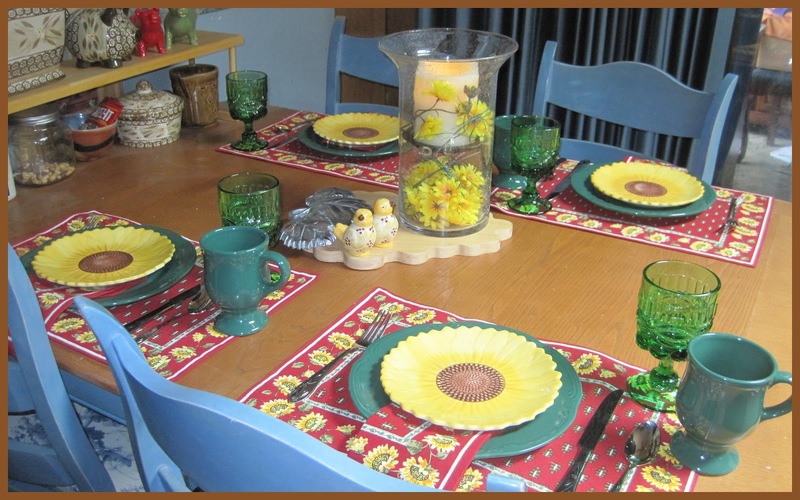 It won't be long before you'll see it filled with fresh strawberry lemonade to go with my strawberry honeybee tablescape! check out the details of the new Monday blog party I'll be hosting. I'm happy to re-post some pictures of my spring mantel. I'm joining the Mantel Party at Fox Hollow Cottage! The temperatures go up and down in Southern Illinois this time of year and yesterday, we needed the fireplace again! Before you skip on to visit the other posts at the party, take a look at the details of the new weekly party I will be hosting on Mondays. 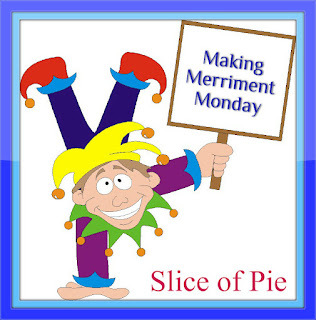 Making Merriment Mondays is an "anything goes" party, as long as your post makes us smile!